Each year, the Trinity College Archives brings out items from its silver collection to be displayed during Christmas High Table Dinner. 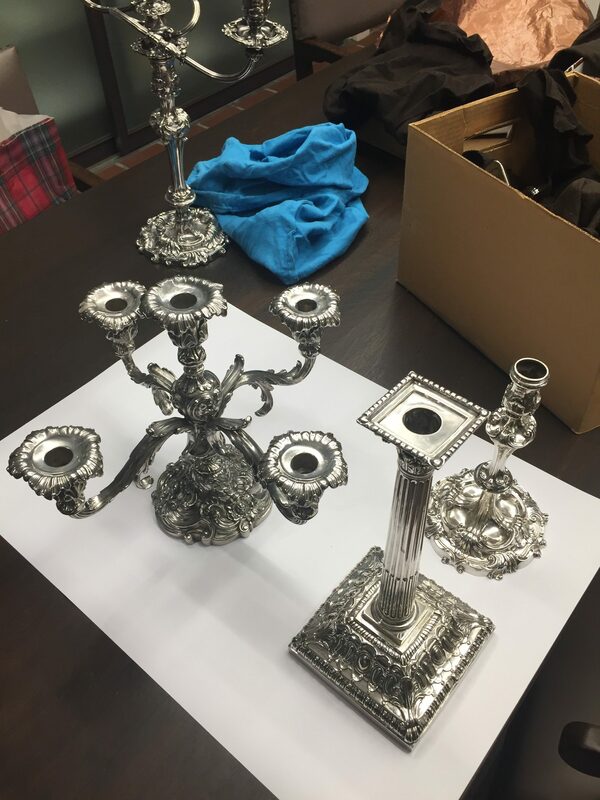 Much of this silver, like the candlesticks in the photographs, comes from the estate of Mr. Gerald Larkin, one of Trinity’s most generous benefactors. Perhaps the most interesting piece is the four-armed silver item seen sitting on the High Table in the image above. This is an epergne, a table centre-piece used to hold confectionaries or fruit and belonged to Bishop John Strachan, Trinity’s founder. Along with his library, the epergne was left to the College in his will with the condition that it be brought out and used once a year. Many items from the silver collection are on permanent exhibit in the Trinity College Archives. I read about the library’s silver collection with interest. This is something I would never have expected the library to own. I hope to see as much of the collection as I can.